yes, this is still on. and now it is on a new server with new code, even though it looks the same. i still need to knock together the "writing a post" bit of code so that i can post without using manual SQL queries. details. it turns out that this thing is still on. it is kind of funny to me that it still just chugs along, but such is the joy of writing your own software running on your own (virtual) server. it is long past time to rebuild the infrastructure here, which may or may not happen. but it is something that i am thinking about again. i get tired of dealing with spam on very old entries here, so the comments now automatically close on posts after one week. you know, on the off chance that i ever post anything of interest again. for the first time in a very long time, i shoved all the logs from this site through a web stats package, and have come to learn that this site averages about 500 visits per day. i signed up for google analytics, and it refused to recognize that the tracking code had been installed. i’m just taking that as a sign that i should continue to not care about traffic to my site. martin jansen pointed out that my feed wasn’t showing up as updated on bloglines, and it turns out to be because i had broken the conditional get handling for the feed. oops. so if you’ve been relying on bloglines, you’ve missed a lot. five years and two days ago, i wrote my first blog entry. i started out using blogger. four days later, i made my first entry with my own blog software. i guess it would have been smart to remove the little bit of code that prevented everyone but me from accessing the site when i flipped the switch on the design. i also “upgraded” the feeds to almost-valid atom 1.0, and got rid of the rss feeds. it is almost-valid atom 1.0 because apparently the atom 1.0 standard requires a non-empty titles. i wrote what i think about that three years ago. atom 1.0 is even worse than other formats in this regard, if the complaints of the feed validator are to believed. not only is the <title> element required on each entry, but it can’t even be empty. nuts to that. other things are undoubtedly broken. some day i may fix them. 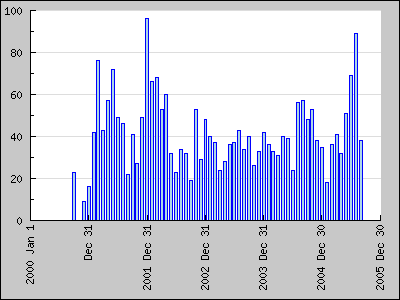 i felt like i’ve been posting a lot lately — here’s a graph of posts per month since i started (way back in october 2000). for the 1792 days i’ve been blogging, i have averaged 1.38 posts per day. my longest entry was my notes from the vsda home entertainment conference, the shortest entry was the percentage chance i gave to moving out of my then-current apartment. trying to read through my archives can be a bit of a chore. it’s one of the things i’m looking to fix with the redesign that i’m slowly working on. so far, it’s not really too radical of a change — but i’ve just been focused on removing things. to kill time (see previous entry), i’ve implemented pingback 1.0 client code for when i post. if it works, this entry will ping the spec and ian hickson’s initial announcement of pingback. what are the odds it will work on the first try? answer: not good. it took two tries. next time i need to kill a few moments, i’ll do the server side. here’s the eps version of the giant monkey head. i’ve added an about page. my rss feed also moved, but there’s a redirect in place for the old location. there’s an atom feed now, too. i just added a tiny little feature to my weblog software to auto-expand links created using an isbn: scheme (such as <a href="isbn:1584790830">i'm just here for the food</a>) to an affiliate link to an online retailer (b&n right now, easy enough to change in the future). just something for those thinking about ways to play with moveable type's upcoming text formatting features. mix with the amazon web services, and you could pretty easily have a page that listed information about all of the books you've mentioned. i do actually cheat a bit right now, and the conversion happens when stuffing the entry into the database. but they end up in a regular format, so it will be easy enough to change the old entries when i work up the initiative to make the filtering happen on the output side. if only the music and film businesses had universal identifiers for their products that worked like isbns. i've got something similar that turns ampersands (&) into the correct entity, even when i don't type them that way (or there are ampersands in urls that i cut&paste into place). just part of keeping my site validating as xhtml 1.0 strict.